Cairo – IOM Egypt, this year celebrated United Nations Day by donating medical equipment to the Cairo Ain Shams Specialized Hospital. The donation included one electrocardiography (heart monitor) device and 10 wheelchairs. The equipment will be used to enhance the hospital’s capacity and ensure higher access to universal health care, leaving no one behind. Through this initial donation, both migrants and Egyptian patients will have better access to health services, in line with President Abdel Fattah el-Sisi’s policy for a diverse and tolerant society. The donation affirms IOM’s willingness to continue working with the hospital in boosting the Egyptian public health system. “This is one of the partnerships that IOM would like to establish with the Egyptian health sector to further support the public health policies of the government. It is an honour to be associated with one of the most prestigious health institutes in Egypt. 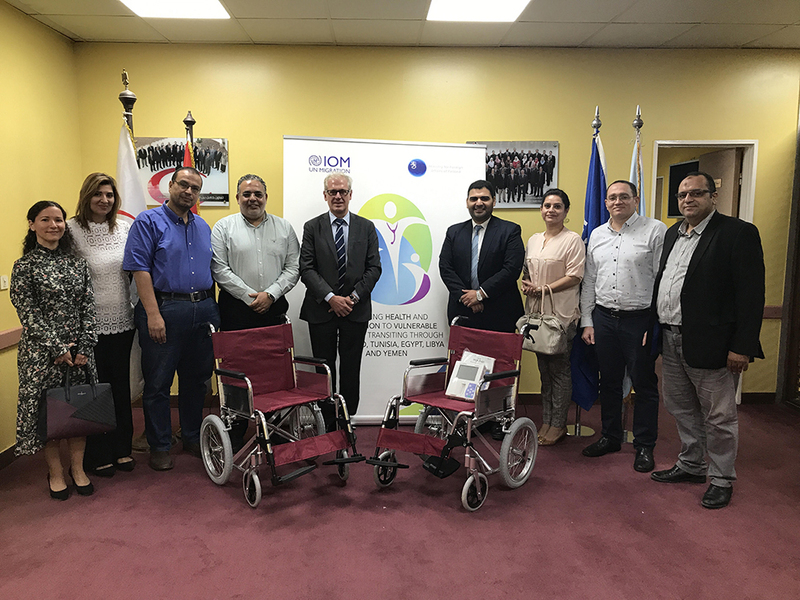 I look forward to further collaborate with the Hospital to help the medical corps to provide adequate services to all patients and to make sure that no one is left behind,” said the IOM Chief of Mission in Egypt, Laurent De Boeck. Following the donation ceremony, the IOM Medical Team met with Dr. Walid Anwar, Deputy Director for the hospital, to discuss further cooperation and plan a larger support programme to be announced soon with the Ministry for Foreign Affairs of the Arab Republic of Egypt. This initial contribution will be followed by further healthcare training opportunities to provide high quality migrant and Egyptian friendly services. The initiative is in line with the Government of Egypt’s Sustainable Development Strategy: Egypt vision 2030 for Economic and Human Development; it also works toward the Sustainable Development Goals, especially ‘Goal 3’: to ensure healthy lives and promote well-being for all ages. In accordance with the above, 24 October has been celebrated as United Nations Day since 1948. In 1971, the United Nations General Assembly recommended that the day be observed by Member States as a public holiday.